So far, we have been able to directly impact the lives of over 1 million children and families. 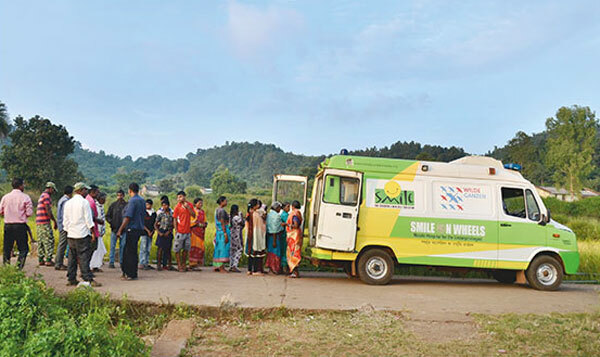 Smile on Wheels is a mobile hospital programme that takes preventive, curative and promotive healthcare to the doorsteps of less privileged children and families in the remotest villages and underserved slums of India. New Smile on Wheels projects launched in five states. 1710 Information Education and Communication sessions were conducted. Sow benefitted 615585 people directly through 39 operational projects covering 585 remote villages and urban slums across the country. 5095 school going children benefitted from School Health Programme that are conducted regularity to build a health seeking next generation. 70% of the total beneficiaries covered in the reporting period were women and children. Focus is given on women and children through ante and post natal care, distribution of iron, frolic and vitamin supplements, immunization and growth monitoring of children. More than before and much stronger linkages were built with government health officials and NRHM,which has further augmented the project's reach to the underprivileged people. Also, intensive capacity building sessions were held for ASHA and ANM workers. 463 multi-specialty camps were conducted in urban slums and rural village, meeting immediate healthcare needs of 31648 people.